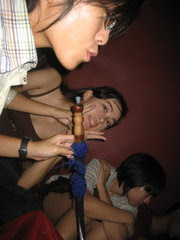 Haha met Jesslyn, Camille, RachelNg, Christina and her two friends for sheesha! I was supposed to meet Jesslyn at 9pm, but at 9 I was still in pyjamas and online haha. Wahzzz Camille now dress so cool eh! Ch-ch-check it out, my man. This was the closest we could get to pretending the ipod is ours. The sheesha place is upstairs! Christina left and we then went to some random pub down the road. Bottoms up because RachelNg and I lost some game we were playing. Haha Camille calls us the Nightlife friends??? 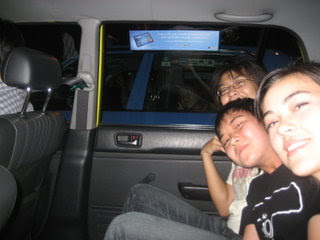 Can you see it's RachelNg in the other cab at the back! Ran my 2.4km the other day! 15+++mins, C! I am very happy, it's not great to you all but I got an E last year! Jump 2 grades okay! But quite fun lah, teacher also not watching. We bought drinks and stopped to talk, feverishly sweeping when we were in front of her. Sports Day tomorrow, means no lessons yay! But still CCA %$%@#* sigh end school early also no use. SAJC's ProjectWork grades are horrendous, like what, 7As? And it's marked by our own SA teachers? AND it's an SA teacher that came up with PW?! Haha unless I do my PI (celebrate someone who has contributed to society) on that SA teacher, later I get A ah hahahahahaha.